One of the most heartening stories of today lies in the variety of ways that millennials are giving back to society. To be sure, they're not the heavy hitters of the charity circuit. According to one recent study, they provide only 11 percent of total charitable donations. That's not surprising, given that they are just beginning their money-making years. No one expects many young donors to turn up at $1,000-a-plate dinners. But these individuals -- the 75 million born between the early 1980s and late 1990s --find other ways to give. An analysis in The Boston Globe notes they are behind such campaigns as #GivingTuesday, the ALS Ice Bucket Challenge, and Livestrong crowd-sourced funding. "They don't give out of obligation. They give out of a sense of mission," Meg Fowler Tripp, an advisor to non-profit organizations, reports. The levels of commitment are remarkably high. An ADP Work Institute poll states that fully "89 percent of respondents surveyed will want to work on personal interests and things that impact society." Millennial entrepreneurs are using their businesses to support charitable causes. That commitment is important because more than any earlier generation, this cohort has turned to self-employment. Forbes magazine observes that a full 67 percent of millennials say they want to start their own business. And for many of these start-ups their mission includes giving back to society. One high profile example is the announcement by Mark Zuckerburg and his wife, Priscilla Chan, that "to leave the world a better place" they will donate 99 percent of their Facebook shares or approximately $45 billion at present value, to charities. But the commitment of millennials extends far beyond this well-publicized donation. John Rampton, CEO of Due.com, posts a "How to show your love as a freelancer" blog, encouraging the self-employed to find their own ways to "give back" to society. There is no better example of a fledgling, socially conscious enterprise begun by millennials than the Toronto-based t-shirt company, Higgins Would Be Proud (HWBP). Two Parsons School of Design grads--Ben Egnal and Fang Yu--created this business in 2013. Like all enterprises, this one began with a good idea. "Higgins is the name of my parents' grumpy old pug," Ben explains. "Even when he was younger, he had the stoic demeanor of an old man. It was hard to get a rise out of him. When we started the company, we wanted to create something that would make even Higgins proud. Hence, HWBP." The firm's initial line of t-shirts emblazoned with Higgins' likeness was a big success. There was the Butcher Pug inspired by the image of the animals that hang in butcher shops. Instead of cross sections of loins and ribs, the shirt featured Higgins' jowls and back rolls. There was also The King Pug, with Higgins' wrinkly face topped with a noble crown. HWBP soon expanded from people clothing to matching hoodies for dogs. They sold their line of human and dog clothing through their Web site: www.hwbp.com. They also pounded the pavement and their merchandise was soon picked up by popular retailers in Toronto. "We're having such a blast," Fang notes, "knowing that we are delivering a product that makes people smile and enjoy life a little bit more." The HWBP brand won an Applied Arts award for complete design in 2014. These two millennials are also giving back to society through their business. "Being socially conscious is important for us," Ben notes. "It's not enough to have a cool t-shirt or design." Since its launch, HWBP has given 10 percent of each purchase to ElderDog. This charity helps older adults look after their dogs, and it provides care for older dogs whose lives have been disrupted because of illness or the death of their caregiver. 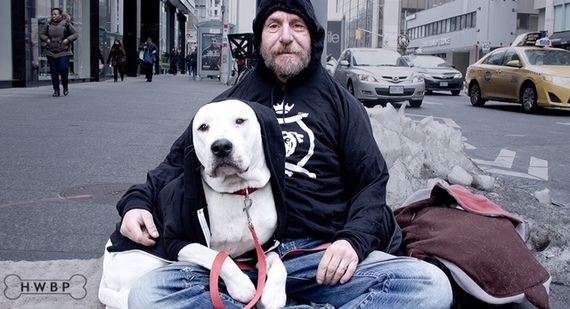 More recently, the owners of HWBP have reached out to the homeless and their dogs. This winter HWBP teamed up with the Fred Victor Centre, a Toronto shelter for the homeless. These young entrepreneurs braved the cold to give out matching hoodies to street people and their dogs. View this video, "Share a Little Warmth," and you'll see how welcome those gifts were. Jane Truemner, Director of Communications and Capital Fundraising at the Fred Victor shelter, says: "We are pleased to be working with Higgins Would be Proud. Every day we have homeless individuals and the animals they love, seeking warmth, food and somewhere to sleep. The Campaign HWBP ran this past December, giving sweatshirts to both owners and their dogs on the street, was wonderful." Between now and the end of March 2016, for every hoodie sold through the HWBP website, another hoodie will be donated to the Fred Victor Centre. (1) Form partnerships with non-profit organizations that speak to your brand; (2) share your products with the needy; (3) donate a portion of your revenues to charitable causes; (4) volunteer on behalf of your business (websites like VolunteerMatch and Idealist.org have wonderful suggestions); (5) support employees when they give back. The founders of HWBP are proud of what they have built. They are pleased they can help others in their own unique way. They have made Higgins proud! And along with many others of their generation, they make it clear that millennials are showing the way. Author's note: Ben Egnal is the author's son and Higgins is her beloved dog.